Hello Luthiers and other guitar-loving visitors. 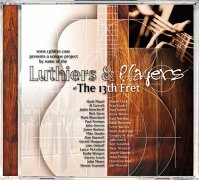 You are now on the 13th Fret, one of the most linked guitar websites in the world. When I say this, people tend not to believe me, but as it happens, “the Fret,” as we call it, has been around since 1992, when its founder, Dave Skowron, began putting it together and going about linking it to everything “guitar” that existed in the world. Think about what you were doing 20 years ago. I’ll bet it didn’t involve linking guitar sites full time! I don’t think a day goes by that we don’t get at least one request to link to one guitar site or another. I’m making a point of this because of some projects we are undertaking to help luthiers and those in the guitar industry generally. It involves better linking this site to the Newport Guitar Festival site which in turn links to the hundreds of hours of guitar photos, publicity, and high definition demos we are constantly updating and posting on YouTube and other places, which have had an extraordinary impact on the links to our sites. It is something akin to what we can only call “viral linking.” It is invisible, but powerful, and I might add, unexpected. Some guitar makers have reported to us that when we post their demos or banners through OUR sites, traffic increases as much as twenty fold to THEIR sites (in the tens of thousands per month), so we must be doing something right. As a result, we are undertaking an even greater “link the guitar world” project in the back shop here, which involves our constant effort to add newer modules to the Fret without it crashing—which has taken us several years to learn how to do. If you are new, or even if you are an old visitor to the Fret, I want to also emphasize the archive aspect of the Fret. It has the oldest living memory of the guitar lutherie world on the the web, including tips, discussions, and all around gossip. This is going to become increasingly important to all of us as it becomes necessary to use provenance, or collateral information to prove the origin of the woods, materials and techniques used when certifying guitars for international transit. I will talk more about that in later posts. The one area which is not of great importance here is our classifieds. Classifieds have never been a strength on the Fret, and unfortunately, it is an area where we increasingly come under attack from hackers and spammers outside the industry. Therefore, enjoy the Fret for its connections in the industry and its amazing archives, but don’t count on the classifieds to be around for much longer. We have a few other surprises coming that you will see, and some you won’t see, but will feel, if you have a business in the guitar world. It involves everything from unusual promotion opportunities, to some possible solutions to the Lacey Act and CITES issues plaguing our industry (I am, after all, an international trade lawyer by training), so hang onto your hats and follow us around for a while. You won’t be sorry! Hundreds of hours of music and video, new clips every month. ©2008 Hill & Lowenstein Associates, Inc All rights reserved.